Our tomato plants are finally slowing down. While I am thrilled with the less work that it gives me, I am already going to miss all the fresh tomatoes! The various cherry and pear tomato plants are the first to go. The harvest remaining is small. This is one dish that is absolutely wonderful with any type of smaller tomato. How can you really go wrong with anything BLT? Bacon and tomato are perfect together. Okay, not the best if you are vegetarian or don’t eat pork. The beauty of this dish, though, is that the tomatoes are the shining star. Just omit the bacon or use turkey bacon, whatever floats your boat. Add even more tomatoes if you want, I certainly would! As with any recipe, especially salads or pasta salads, this is quite flexible. In addition to the previous bacon substitutions, there are many ways to do the “lettuce” part of the BLT. This time I chose to put the pasta salad on a bed of spinach and arugula. I have also chopped Romaine lettuce and mixed it in with the pasta salad. The key to this preparation is that you will need to eat all the salad at once so the lettuce doesn’t wilt, making it ideal for a party or large family gathering. There are plenty of other lettuces that would work as well. You can also play around with the dressing. This time I used a store-bought chipotle ranch dressing mixed with the mayonnaise. Plain ranch is also good. Obviously homemade ranch and mayo are also great, but let’s face it, sometimes quick is a must. I was making four cakes when we had this salad! This time I used mini shell pasta, but rotini, penne, macaroni etc. also work. Make it early in the day and let it sit in the fridge. Then toss all together for a quick dinner, or better yet, take it on a picnic. This also pairs wonderfully with a glass of red wine. I can’t believe my little snail friend hasn’t made an appearance on the blog yet. 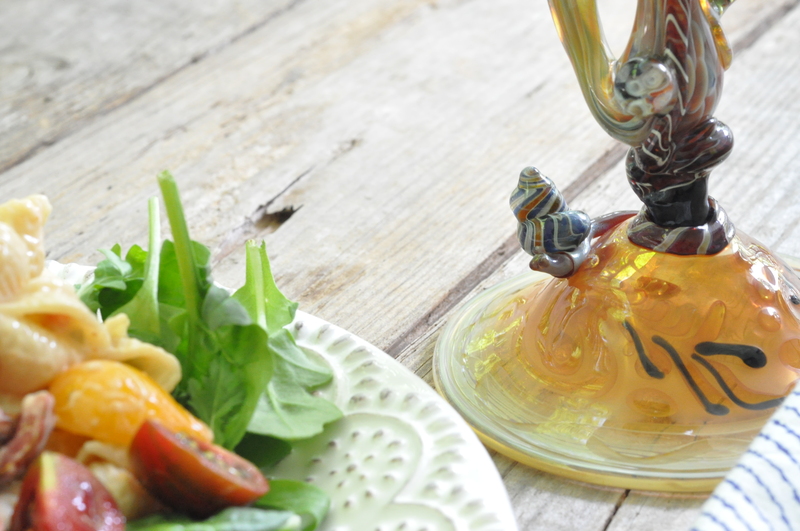 This glass filled with some red wine and a tasty meal will cheer anybody up! Your tomatoes are slowing down? Mine are just now starting to turn pink. Luckily, the farmers markets have some great heirlooms to buy. One of my favorite Summertime treats are BLT sandwiches. 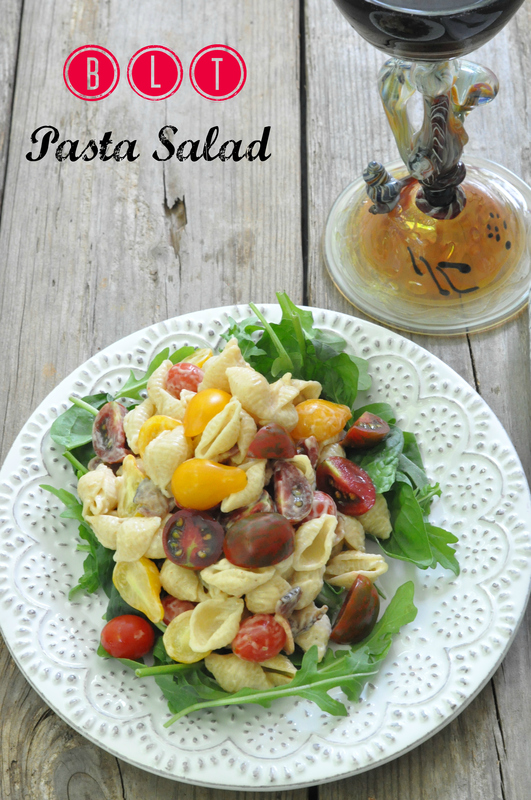 Using those flavors in a pasta salad is genius! I’ll be making this, for sure. Thanks! We have had a few BLT sandwiches too! Such a classic yummy lunch. BLT pizza is also wonderful. I feel a bacon craving coming on. Enjoy your tomatoes, I will miss mine once they are gone. The plant leaves are browning and growth slowing, there is only so long they can survive the intense heat here. Wow. 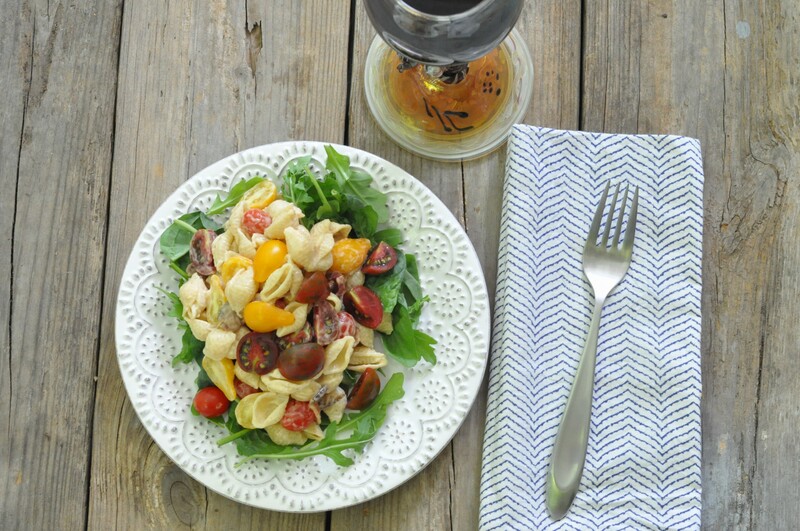 I love BLT, but never thought about using it with pasta. Thanks for sharing. Emma. 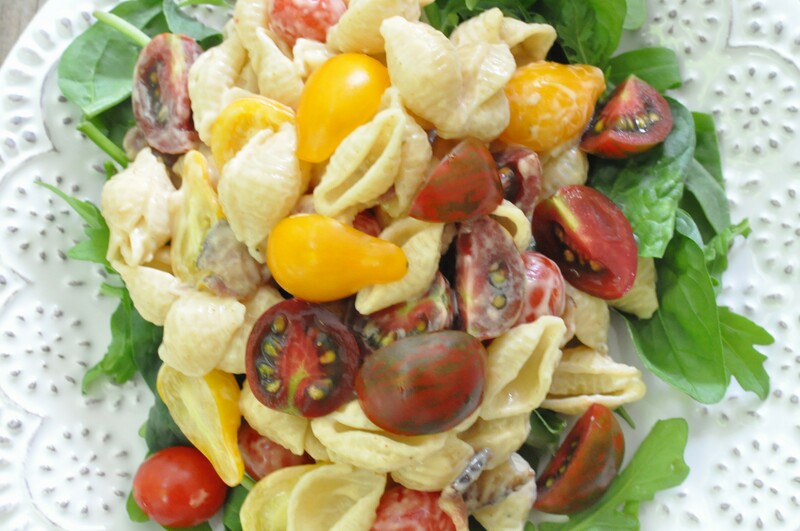 I don’t even recall why I started making a BLT pasta salad, but I’ve been doing it for over 15 years and love it! Mmm, club is sandwich style pasta salad sounds great! I am tinkering around with a chipotle ranch dressing. I will post one as soon as I get it perfected. I did manage to pick another basket of tomatoes today so I had a salad chock full of cherry and pear tomatoes for lunch. The larger ones need to ripen a little more before I make another batch of roasted tomato sauce to freeze. Before I know it the pumpkins will be upon us. Where does the time go?! Speaking of which I need to freeze more pesto! I have some but can always use more during the fall and winter. I see brilliance here 🙂 Bacon, lettuce, tomato, salad. Absolute definition of summer. How did I miss the lovely salad? It looks so delicious. I can have this for my lunch right now. The photos are awesome and that plate is a keeper!!! I love that plate too! This is indeed a wonderful pasta dish and extremely popular everywhere I take it. Thank you for all the compliments and always stopping by.